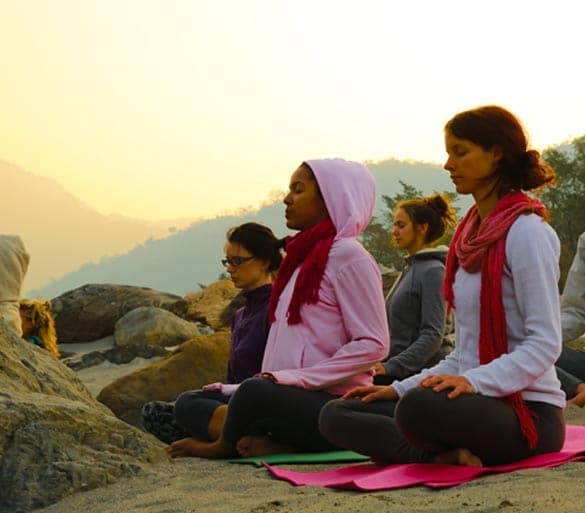 Yoga Retreat with Rishikul Yogshala in Rishikesh, India. Relax, recharge and rejuvenate with a one week or two week long Yoga and Meditation Retreat with Rishikul Yogshala. 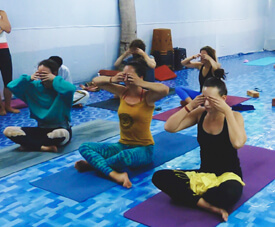 A spell-binding Yoga Retreat in Rishikesh India is sure to reverberate your mind and soul with speckles of purity and love. Let go and embrace your soul in the most beautiful form with us. Fall in love with the true essence of life all over again. 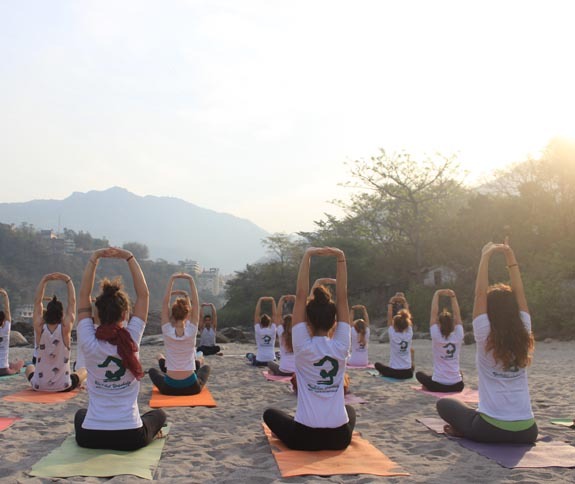 Our retreats and Yoga vacations in Rishikesh are the perfect balance of Yoga, Meditation, Pranayama, Ayurveda and Yoga Therapy for those willing to experience this lifestyle at a relaxed pace. The price includes tailored sessions, massages, excursions, three meals per day, and a private accommodation. 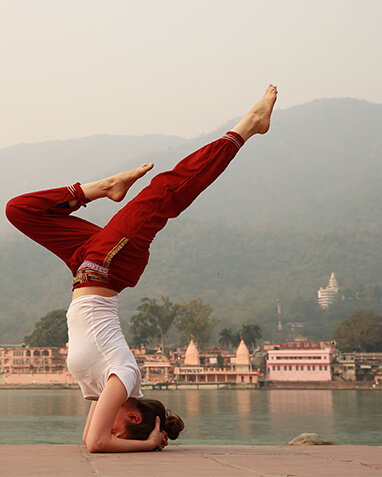 The health and yoga capital of the world, Rishikesh is the most appropriate place for taking up a soulful retreat. The holy atmosphere of the town makes one indulge and dig deeper into their conscious. Located away from the carnal city life, with the magnificent Himalayas surrounding the ashram, every morning becomes a blissful one. Near to the Holy River Ganges and the famous hanging bridges, Ram Jhula and Laxman Jhula, encapsulated by spiritual vibrations, the Yogshala receives blessings of the divine to carry out its tasks. 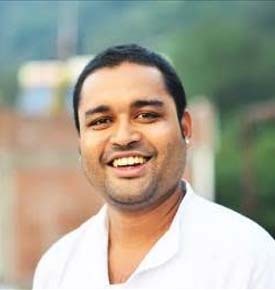 The food offered at our Yoga retreat centers in Rishikesh is in line with the Ayurveda methods and every person is prescribed the kind of food most suitable for them. 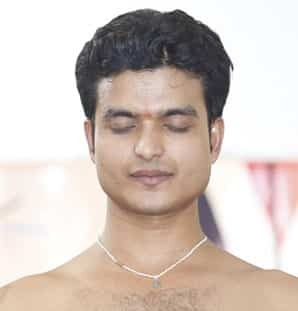 Cleansing procedures are carried out by the school, in the form of Shatkarmas (the six yogic cleansing works) as prescribed by the yogis in ancient times. Soul soothing spa experiences with massages and polishing, this would become an experience you would cherish for a lifetime. Each day assures to be life transforming imparting a change, both physically and mentally with every passing day. 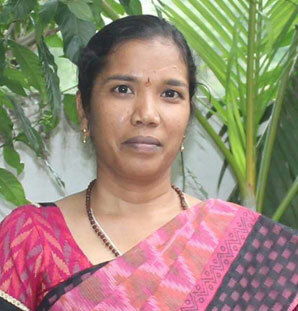 Revive your soul and learn new concepts of staying healthy and fit through yoga. 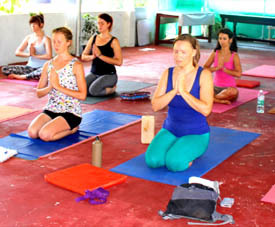 A complete package of Yoga holidays in Rishikesh that will refresh you entirely. Mix and socialize with different people. Find deep relaxation and connect with your inner being. Daily organized trips to local sites of interest shall also be the talking point of our Yoga retreat in Rishikesh 2018. 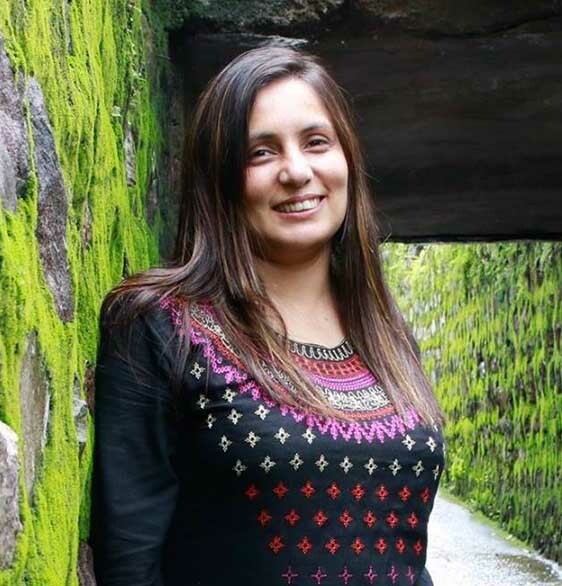 Accommodation Dwell in the lap of nature reserves overlooking a plethora of lush-green farms and the beatific Himalayas in the backdrop at our school. 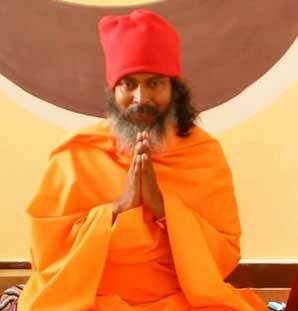 We take immense care to provide our guests with a clean, cozy, and ashram-like environment so they can experience the true yogic life as mentioned in the Vedas. 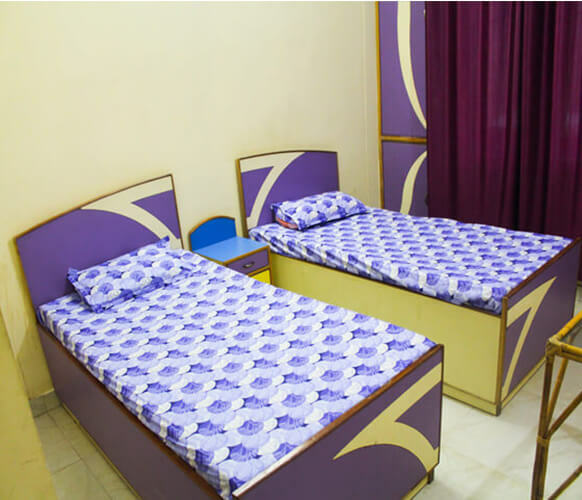 However, keeping in mind the requirements of a contemporary yogi, we strive to bring a balance between the two by providing comfortable rooms with the basic amenities such as twin beds, lights, fans, geyser, attached washroom, seating area, etc., for our guests to enjoy an uncompromising stay at our facility. 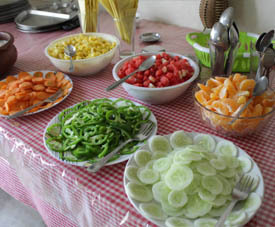 Food Pamper your palate and body with traditional organic delicacies prepared by our chefs at the ashram. 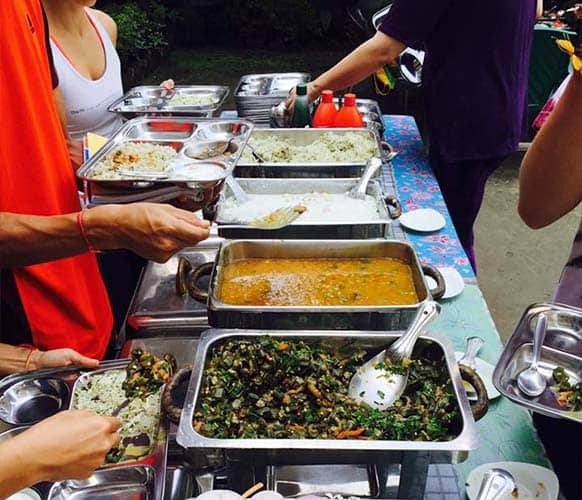 We offer vegetarian meals thrice a day, completely yogic in nature and composition. In addition to mouthwatering, freshly cooked delicacies, we also serve tea and herbal drinks as vitalizing accompaniments. Explore from a variety of spreads from Indian to Continental at our school without compromising on the health. 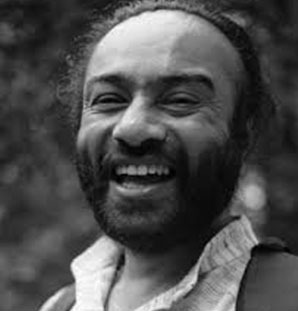 We believe in fostering an authentic yogic lifestyle. Hence, the diet we serve is according to the body constitution and dietary requirement of our guests. 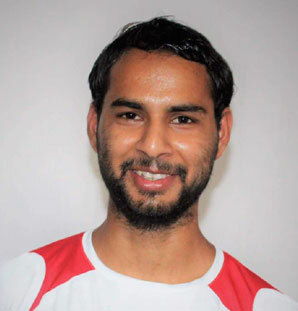 How To Reach Us In Rishikesh? 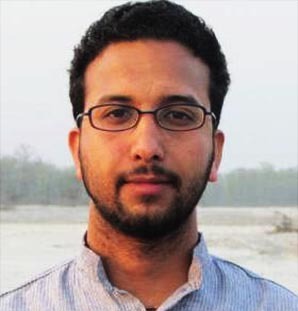 By Railway : : Rishikesh is connected to trains in abundance with three slow trains daily and other fast one connecting through Haridwar. One can easily take the train, get down at the station to take a taxi or a shared auto rickshaw and reach the market area. Taxi Pick Up : School offers taxi pick up from all the airports, railway stations, and bus stations at additional cost. 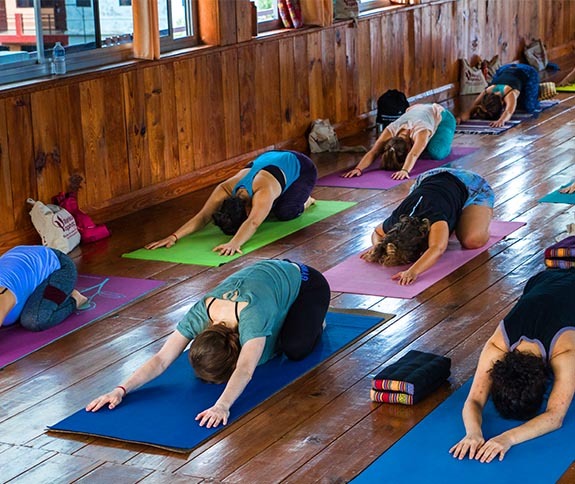 Catch a peek into the traditional side of yoga, it's system, and discipline at the best Yoga retreat in Rishikesh with us. Revitalize the mind, body, and spirit and enliven a soul-soothing experience. 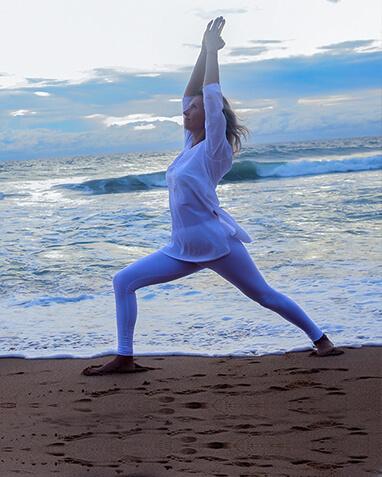 Get introduced to the refined teachings and practices of yoga. 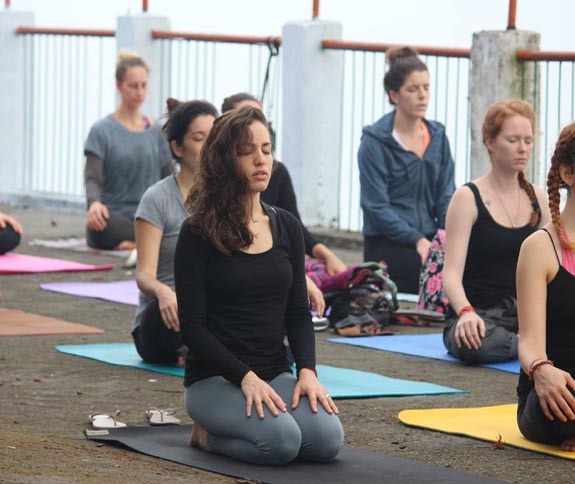 During Yoga trips in Rishikesh, live an opportunity to meet like-minded folks from across the globe. Capture the most blissful and sacred moments of a lifetime.